I confess – I was a bad person today. And here’s why…. 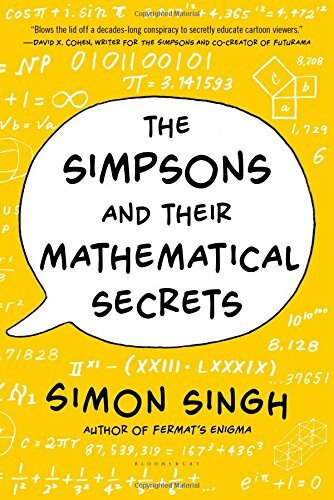 One of my recent reads is Simon’s Singh‘s fun book The Simpsons and Their Mathematical Secrets, where Simon shares math gems from Simpson’s episodes hidden craftily by the math-centric series writers. I confess I haven’t been a regular watcher of the Simpson’s for many years. This book took me back to the fun of many of the early episodes – like the corny “R D R R” gag from season 1. In my morning class, a few students quickly “verified” that the equation was true, and the rest trusted them. Bless them…..I can now dangle more bait…. , where n is a positive integer greater than 2. I really admire the students who tried here, even those who pretty much ignored anything else we were trying to get done. The agony when they came oh so close to a solution, only to see it break apart. I really can’t let this go on, can I? STUDENT: Do you have any advice for us? Please? STUDENT: Come on…give me a hint here. ME: I am…give up, it’s the best advice I can give you. 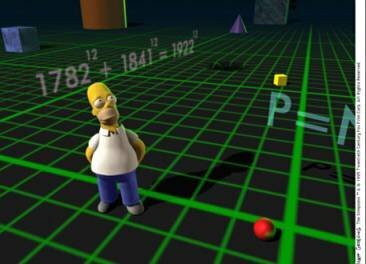 Letting students off the hook, we shared a brief discussion of Fermat’s Last Theorem, and why the Simpsons’ folks were so clever with this “near miss” in their Halloween episode. Many stayed behind after class to hear more about some of math’s long-standing mysteries, and how exactly Fermat’s Theorem was eventually proven. After my bout of evilness, it was a pretty cool day. The Simpson equation does claim that even + odd = even. yep, we observed this eventually in one of my two classes. Sometimes simple is so much better than brute force.